Blog to book success stories are inspiring, but not every writer will have the good fortune to be signed by a major publisher and go directly from blog to book. It takes time, hard work and a little bit of luck to get the book deal. The path may be convoluted – life may intervene. But there are other ways for writers to be rewarded for their blogging while waiting to be discovered. Here are some examples. Businesses both large and small are discovering the power of blogging. For writers who have the discipline and writing skills to blog, opportunities abound. To see some examples of blogging and blog related jobs available these days, visit BloggerJobs.biz. Jobs include writing, editorial, marketing / PR and some more technical positions. The range of topics is quite broad: music, home design and architecture, asian food, baking, search engine news, celebrity gossip, beds and mattress products, politics, frugal living, interior design, weddings. You get the picture – pretty much the universe. Many of these jobs are at blog networks – the new magazines of the Internet. But many are also at traditional media outlets. Blogger pay has been the subject of controversy. 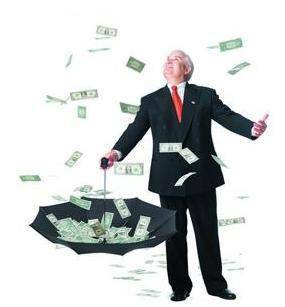 Pay is often a base salary with bonuses for increased traffic. To get a feel for how this discussion has evolved over time check out the 2005 post “Advertising, editorial lines blur as bloggers’ salaries tied to traffic” by Mark Glaser on the USC Online Annenberg Journalism Review and the recent post “What’s the perfect formula for blogger payouts” by Abe Olandres on the Blog Herald. In an article “How to Launch a Career With Your Blog,” Fast Company highlighted several different approaches. A popoular blog, related to a business area, can lead to consulting and speaking engagements that require the particular knowledge or expertise of the blogger. It can also lead to conventional, (non-blogging) employment with a company that is impressed by what the blogger has to say. How about advertising? This can provide a blogger some incremental monthly income, but it is clearly tied to the level of traffic on the blog and the topic area. For most bloggers, it won’t pay the mortgage. 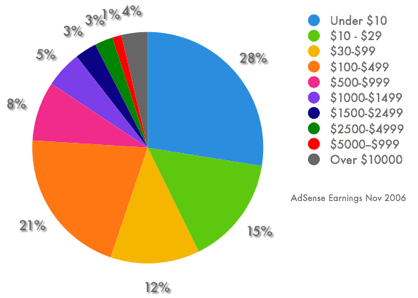 Darren Rowse of ProBlogger.net periodically surveys his readers who use advertising on their blogs to determine the level of income they earn from it. The pie chart below shows the distribution of monthly advertising revenue from his November 2006 spot survey. The lesson here is that there are many ways to turn your blog writing passion into cash. Not all of them will allow you to quit your day job. And perhaps none of them is yet as sweet as that big book deal with a major publisher.